The ladies of The Broke and the Bookish this week have tasked is with a doozy of a list. They have asked us what items are on our Bookish Bucket List. I haven’t honestly given this topic a whole lot of thought in the past, but I can put one together. I mean, why in the heck not? 2. Attend BEA one of these years. I believe 2016 will be in Chicago. Who’s going with me? 3. Do something OUTLANDISH! With the show coming out this summer and my over-the-top love for all things Jamie and Claire, I think it would be fun to do something inspired by Outlander. The only problem is that, uh, most OUTLANDISH activities are kind of gross. I mean, I GUESS I could give someone a black eye and then stick a leech on the bruise to reduce the swelling, but ewwwww. Plus, you know. Assault is frowned upon in polite company. Hello, gorgeous. I can’t wait to read you! 4. 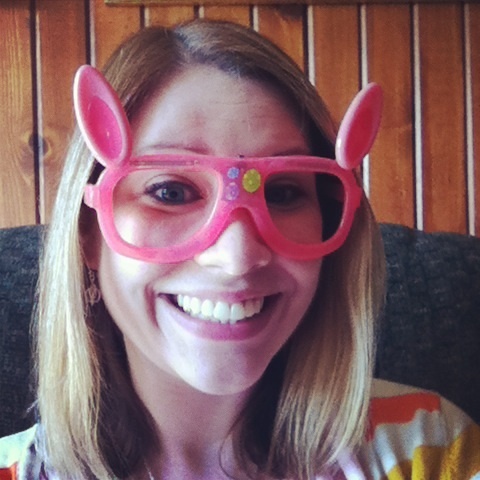 Meet another book blogger! I’ve got some AMAZING blog friends that I’ve met in real life, but none of them are book-specific bloggers. It’d be nice to meet one of these crazies face-to-face, you know? 5. Increase the traffic Words for Worms gets. That’s not so much a bucket list item as an ongoing thing, but it’s my list. I can make it vague if I want to. Luckily, my friend was able to make it so I was practically THERE. 7. Start a meme. I know, it sounds ridiculous, but I think Top Ten Tuesday is super fun and I’d like to come up with something as awesome. Of course, I’ve been toying with the idea for quite a while and I’m still lacking a concept. Ah well. Bucket lists aren’t supposed to be realistic. 9. Throw a book themed party. This one might actually get off the ground. My IRL book club has a member expecting a teeny tiny bookworm! Bookish baby shower, anyone? What about you, Bookworms? 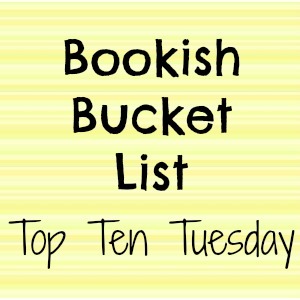 Do you have a Bookish Bucket List? What’s on it? Your post inspired me to participate in the Top Ten link-up as well. Used the same button you have in this post, not sure if it’s yours or TBATB’s, but I gave props to you both in my post today. Hope that is ok. I made that button, but feel free to use it! My graphic design skills are elementary at best. If you like the TTT series, they have significantly more attractive buttons over at The Broke and the Bookish :). They won’t let you kiss the tomb anymore?! That’s CRAP. I’ll go with you, and distract the staff with my awkwardness. I love LM Montgomery’s books and have wanted to go to PEI for a long time. That’s definitely a dream trip of mine. Every winter in high school, my little group of friends had a Jane Austen Tea Party. We’d have fancy snacks that we imagined were what you’d have at a tea party and watched one of the various movies of a Jane Austen book. Um, yeah, we weren’t the coolest girls in school, but hey we had fun with it 🙂 ! Oh my goodness, that Jane Austen tea party is just about the cutest thing I’ve ever heard! How fun! Now I want to have a tea party! Muahahhaha! I’d probably have PETA after me if I got a goat drunk intentionally, but that sounds like a recipe for hilarity. When I went to Scotland I re-read Outlander on the plane and while I was there. I kinda cried when I was at Culloden. Saw some standing stones. And have been to Stonehenge. But yeah, I’m not down with Medieval hygiene. I went to Stonehenge, it was amazing. Even though I was hungover. And it was cold. It was cold when I went, and we randomly saw a bunch of Canadian Military guys there that were in the UK for some kind of training. It was funny and random and they were from the base that’s like 10 minutes from my apartment. Woohoo! International travel for books! I’m totally with you on almost ALL of these. I live in the middle of nowhere as well. Sigh. BUT I’m only 10 hours (or so) from Chicago and I think I might just have to hit the BEA in ’16. We are gonna party like it’s 1999. Again. Um. That didn’t come out as cool as I meant it to, but HELL YES! Awesome list! I love #3. Can you believe I’ve done something OUTLANDISH? I made a comfrey poultice for my husband’s ankle one time. It was hilarious. So messy and stinky. I would love to say it helped, so I will.. It TOTALLY helped. And you have to do #4. I’ve meet two and it was wicked awesome. DUDE, I’m SO impressed! You made a poultice. That’s so badass. Love your list. I’m hoping to make it to the BEA this year, but we’ll see. If not, then Chicago could be a possibility! And I’m meeting another blogger tomorrow! I’ve found that living in Edinburgh has increased the likelihood of meeting other bloggers. Good luck with all of this. I’d love of attend the Hay Festival in Hay-on-Wye. Go to Scotland is on my list thanks to Outlander. Growing my stats isn’t on there, but it could be. I am totally stumped on that one. You’ve been to some super cool places, I’m kind of surprised that you haven’t been to Scotland already! I would totally come to your book-themed party (book bloggers at a book-themed party! That would cross two off your list!) and participate in any meme you came up with! Good luck with #10! From those caps you sound pretty determined! Heck yeah, two birds with one stone. BOOK PARTY! Numbers 2 & 4 for me too! Really, any number of conferences would make me happy. (I almost had this done in January too – stupid snow!) Great Goals! If BEA comes to Chicago (I say that like I still live there), I might see about getting a one-day pass, assuming that’s a thing. Less expensive, and probably about all I could handle of the crowds anyway. LOL, I say Chicago like I live there too, but shoot, it’s sooooo much closer than NYC! I’d help with growing your blog ##’s, but I’m pretty sure most of my readers stop by here too! They’re opening an expansion this summer and I want to goooooooo so bad! I think I can talk Jim into a trip. I hope :). A book-themed party? I am going to have to steal that one. That sounds like so much fun! I think it would be, too! Book partay! I love almost all of these ideas, especially going to Wizarding World (I guarantee you I would cry like a baby just walking through the gate) and going to an author signing. 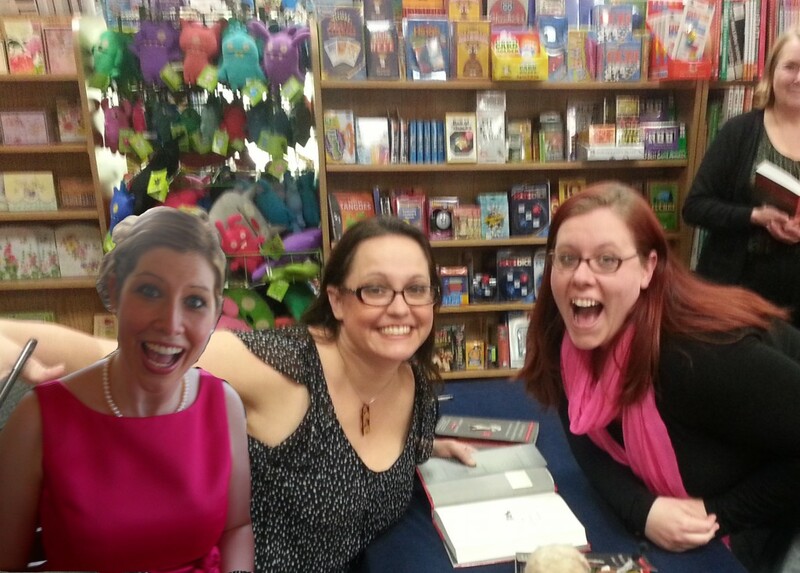 I just can’t drive 1-2 hours to see an author no matter how much I want to. In other news, today I found I am expecting a BOY. A baby boy with two big sisters. Hellllllllllp. A Boy!!!!!!! Congratulations! I suppose I’ll forgive you for NOT naming him Katie :). Very exciting. Maybe when the kidlets are a bit older you can take a family vacation to see Harry Potter World? Or… You could just dump the kids on the grandparents and go by yourselves. Babymoon? Hahaha! I would gladly name my son Katie if I could go on a kid-free vacay to Harry Potter World! I have a feeling I’m going to catch the BEA bug after going this year, so if you and all the other Midwest bloggers might go in 16, I’m going to have to be there! I’ll be honest, I’m terrified of traveling to NYC! That, and the cost of having to fly have me waiting until BEA comes to my neck of the woods. Outlander, so much books, Harry Potter, The Bloggess. Nice list! WWoHP would be on mine too (I might have to make one now!). And I love the idea of going somewhere a book was set, but since I mostly read fantasy a lot of mine aren’t, how you say, “real.” If you have a book-themed baby shower I hope you post pictures! Oh I will definitely post pics of that baby shower if it comes to fruition! Awesome list. I too would love to attend BEA, one day, maybe next year! 2016, Chicago :). I’m just saying! I would love to attend a book expo, whether it is BEA, ALA, or any book conference. Agreed, they sound so awesome! BEA in Chicago, really? Hmmm that gives me 2 years to get my act together…we shall see…maybe we could cross that “meet other bloggers” thing off your list too?? 🙂 I am finally going to meet another book blogger IRL at the Rochester Teen Book Festival (Katie from Doing Dewey) and I am stoked! Finally, a like mind!! Haha. It’s crazy to me how many people want to start a meme is on their bucket list. I want to think of something so unique that everyone would just love. But alas!! What is there!! I’ve done #1 super fun… I’ve done # 4 super terrible! I am going to check out that post where you ‘went to a book signing!’. Looks hilarious! 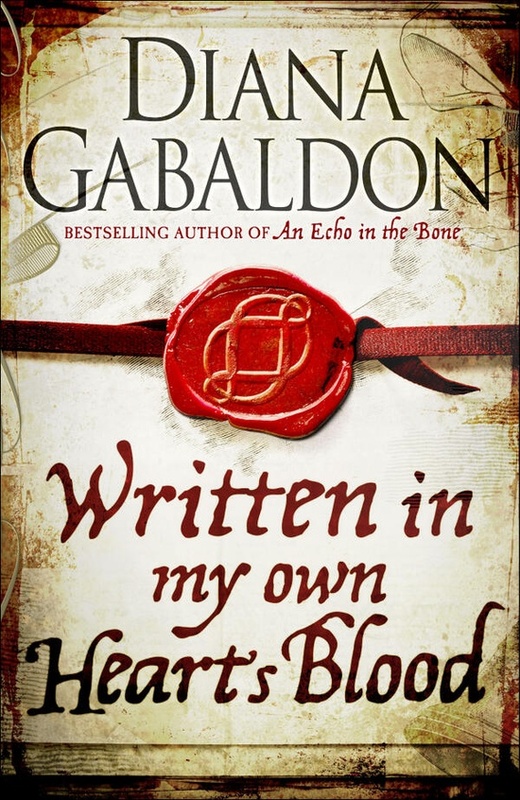 I have yet to read Outlander-really need to get to that at some point this year! I want to throw a bookish party, tooooooo!!! BTW, you better link up to the original (ahem, started by me and Allison) Bookish Bucket List, too! Hey, what about a trip to Scotland in order to get that Outlandish goal?? I’m in! I would love to host a book themed party some day too! This is something where I’ve not been admitting to myself how much I’d like to do it because I’m not sure I could pull it off. I did recently find a real life book club though, so maybe I actually have enough in person bookish friends that this could happen. That would be awesome! I don’t have super Pinteresty aspirations, I think I might be able to pull together a modest affair. I’m glad you found an IRL book club! I hope it’s a wonderful experience!